Stretchtape’s hand stretch films are ideal for smaller warehouses with limited numbers of pallets to wrap on a regular basis, or as a backup for warehouses using machine wrapping methods. Hand film is typically ideal for those who are wrapping less than 10 pallets per day. If you’re wrapping more than that on a consistent basis, we suggest you check out our Machine-Grade Stretch Film to save time and increase efficiency. Hand stretch film quietly unwinds from a handheld dispenser which has a braking system, allowing the user to maximize the stretch of the film as he or she walks around the pallet or package to be wrapped. Hand stretch film also has excellent tear and puncture resistance, sticks only to itself, and poses no risk of damaging a product. Hand stretch film offers an alternative to shrink wrap, which is applied loosely around an item and requires heat to “shrink” and secure the object. 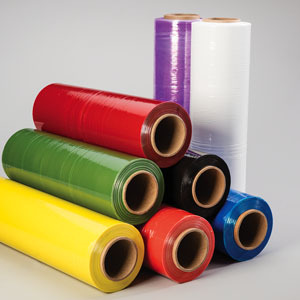 Instead, stretch film is a highly stretchable plastic film used to wrap items of all sizes. 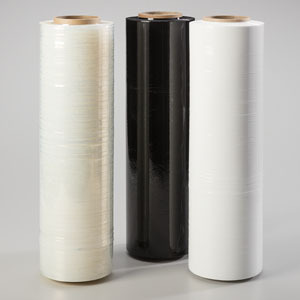 The film’s elastic recovery keeps the items tightly secured without causing any damage to the product when the film is removed, unlike tape or other binding options. Stretchtape’s hand stretch film can be stretched up to double its original length. 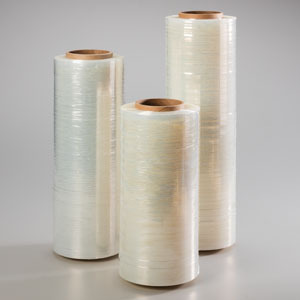 When stretched, the film’s elastic memory tries to return to its original size and as it does, creates a tight, secure wrap around the package or load, keeping it safe during transport.